Why Perform the Dherbs.com 10-Day Electric Greens Combo Regimen? Some sources of free radicals are air pollution, cigarette smoke, UVA rays, UVB rays, and other irritants. It’s thought that free radicals can cause mutations in cells, including DNA. What Does The 10 Days Electric Greens Combo Regimen Consist Of? Complete with instructions and a dietary regimen. What’s the difference between the 10 Days Electric Greens Combo Regimen and all other Dherbs.com cleanses? Yes, it is the only product we recommend for nursing mothers. Hi DHerbs! ~ I have a few questions: are all of the pills/powders Vegan and are the capsules Vegan (non-gelatin based) as well? Thank You! All of our products are 100% all natural plant life herbs. We do not use any kind of unnatural ingredients including animal products, gluten, GMO, binders or fillers. We only use vegetable capsules. Yes, this regimen is safe and beneficial to take while pregnant. It helps boost your immune system and naturally cleanses the body. 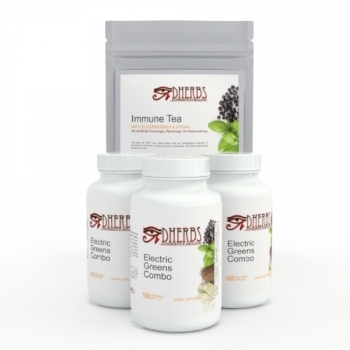 Yes, the Electric Greens Combo helps to boost your immune system.